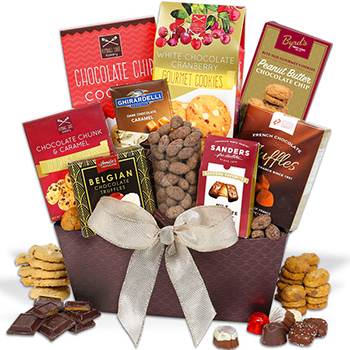 For the recipient who loves to indulge in the best chocolate, we've gathered the world's finest confections in this mighty gift basket. Your overjoyed recipient will indulge in super-chocolatey chocolate chip cookies, made with all natural ingredients; a rich Dark Chocolate & Caramel Smothered Grahams; delicious gourmet Milk Chocolate Sea Salt Caramels; and mouthwatering Coco Dusted Dark Chocolate Almonds. Celebrate the sweetness of success, send your congratulations, or say Happy Birthday to anyone on your list with the Chocolate on My Mind Gift Basket.